Surely there’s a song in that title – the closest my in-head song repertoire is coming up with is Willie Nelson et al being ‘Back on the Road Again’ – can you do any better? Share a link in the comments if you can. It’s been an interesting few months – regular readers and friends on Facebook have the gist of it, with a lot of falling over that began at the end of October (me) and continued on at the end of November (YD) dealing with the results of those, Deep Vein Thrombosis (me) and breaks and fractures (YD) – interspersed with losses and Christmas and slow healing and excessive and unusual heat, plus thunderstorms and downpours more suited to the tropics than the Riviera of Antarctica……. and let’s not forget a laptop that completely gave up the ghost on Christmas Day followed soon after by a mobile that went out in sympathy leaving me briefly but entirely devoid of any contact with the outside world. When life goes south on you it is always a wonderful opportunity to become mindful of how many ways you are loved and supported. We have had many opportunities to be mindful and grateful. At the top of my list is my eldest daughter who dropped her life and flew in to care for her sister for the first week she was home from hospital. And when my phone was declared deceased immediately funded a new one. Second is the phenomenal rallying around and support offered to YD by her friends and work place as she recovers and after 50 days at home begins to take her first tentative steps back into the world in a moon-boot. Next comes my phenomenally generous and kind ‘friend who blogs’ the amazing Alys over at Gardening Nirvana who sent a note that left me speechless along with the money for a new lap top. I was left silent and humbled in the face of such powerful generosity of spirit! I’m also grateful for an understanding of therapies and foods that feed the body and soul and hasten healing. I’m grateful for the ability to look at incidents like this and see a bigger picture. I’m happy that YD and I can laugh at ourselves and support each other even if it is like a couple of old crocks. But my goodness after almost three months of on and off trauma I was tired out and so was poor Siddy – he has been so busy with visiting and caring and helping out, his little eyes just droop as soon as we get to a ‘sitting’ or ‘waiting’ part of the day. We were both longing for a day at home in cooler temperatures. And today we got our wish at last. Good things ALWAYS arrive if you are patient enough! So here we are – to say ‘Happy New Year’ even if it is three weeks late and to thank you all for those comments, emails and messages that have kept me buoyed up and forward looking even on days when I wasn’t. The tiny courtyard garden has thrived this summer and in a few quiet moments we have enjoyed visiting it no matter the weather or time of day. This was us taking a short break one evening just before getting the hose out ……..
And as days return slowly to a normal rhythm I have even begun to work once more in my art room, stay tuned for anything coming out of there. And my mind turns also to the upcoming reunion of friends who first met up in Washington DC almost three years ago and who first met through reading each others blog posts here on WordPress. Stay tuned for more on that……. Thanks for coming by today and catching up with us here, I love that you do! Hi, Happy New Year every onel! I’m starting off with a look back at a highly secret project that took a chunk of my creative time last November – December. So, for that lovely Holiday Season just past, I designed and made a Christmas gift for a Whovian. It was kind of a mad idea, seeing as how I had never really seen the show and had no idea how I was going to make the vision I had in my head a real three dimensional experience. It sure was a chance to get really creative! What these photos don’t readily reveal is the three dimensional thing that is actually going on………. It is designed to be viewed in the round and hung away from the window for maximum rainbows. When it was being photographed it spun out a kaleidoscope of colour through my living room. Of course the charms include a weeping angel and a dalek, the Tardis, two red hearts and a sonic screwdriver – all things pertaining to to the story lines and the Doctor himself. 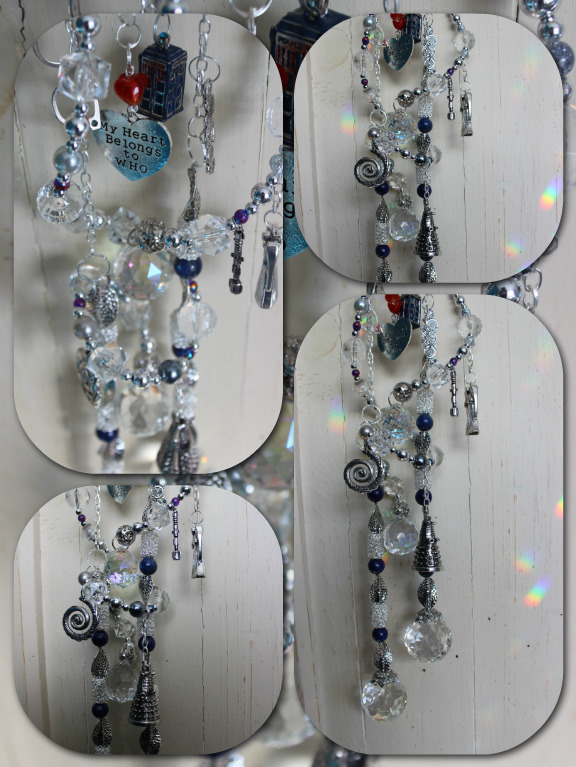 I had such fun making this light catcher and it really does give the feeling of spirals and vortexes and galaxies and such like which the Whovians of the family assure me is what it is all about! I hope your year has gotten off to a good start and that it will unfold with fun, learning, new opportunities and much love given and received. This is where you, my favourite global blogging community, get to decide who you would most like to see receive the Christmas Light Catcher. Remember, you may select two only and the poll will only let you vote once. There are no rules, no right or wrong – just your considered opinion, or feeling for or gut response – whichever one you go by – then simply select the two nominees who touch you the most and mark the corresponding alphabet letters in the poll box at the bottom of the post. Thank you for your participation and for joining with me in this somewhat experimental attempt to spread a bit of unexpected rainbow filled light out into the world. The poll will be closed and no further votes will count after 6 pm [NZ time] 3rd December. In the interests of getting the package sent off as quickly as possible to the winner [mail slowing down horrendously from this point on of course], if you entered someone in this giveaway could you please contact me privately via the email address on the ‘Contact Me’ page with the postal details of your nominee just as soon as possible. 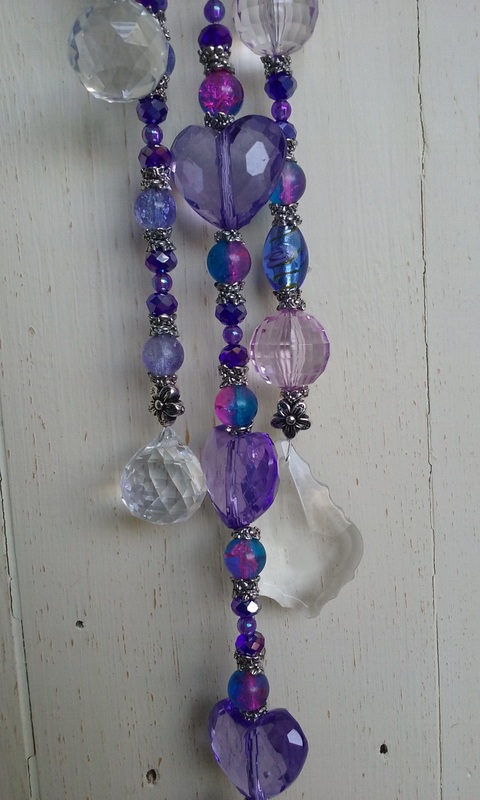 I have a wonderful friend for whom this beautiful light catcher would be a perfect gift. Each of its strands holds a special significance, as if Pauline had her in mind. She gifted her friendship to me more than thirty years ago and, thanks to a miracle and the protection of angels, it is a gift that continues. Over twenty years ago, on my birthday, she was involved in a serious car accident. My birthday became her life day, a constant reminder that life and each passing year is a precious gift. Her many injuries, requiring numerous surgeries over the years, did not injure her bright, cheerful nature and positive outlook on life. Although she lives with constant pain you wouldn’t know unless you asked, and then only if she chose to tell you. She has an enormous generous and loving heart, and her home is warm and welcoming. Family, especially her two grown daughters and her dear Mum who passed this year, is important to her. She loves to bake and craft individual gifts for her family and friends. She is always busily thinking of others. She is a gifted musician and amazing music teacher. She plays the flute and sings like a Robin. She incorporates music and fun into classes for children and lessons for adults learning English. All come to her classes eager to learn and leave singing with joy and acceptance. At Christmas the family gather round to decorate the tree and “remember the moments” marked by ornaments made by smaller hands, collected on travels, or signifying achievements and occasions like graduations and engagements. I know my friend would treasure this beautiful light catcher as another reminder of life’s precious gifts and moments that make it magic. Thank you Pauline for the opportunity to express openly how much I value her friendship. I would like to nominate my friend Angela. she is a true angel and particularly at Christmas time. She helped me and my fiancee as he left this world, delivered my baby, is a nurse manager of a busy city hospital and looks after her three children in her spare time. She also helps organize her hardworking husband, two dogs, has a garden and has THE most wonderful Christmas dinner every year for multiple people. She’s just another unsung hero is my friend Angela, who loves Christmas and quite frankly MAKES Christmas for all of us. Melanie (my daughter) was diagnosed with a brain tumor a few years ago now and, while her 5 yr survival chances were estimated at 50/50, she is still “with us”. Because of the tumor, and so much residual damage from numerous radiation and chemo treatments, she is unable to hold down a regular job. Her focus is very good, but her memory less so. She has internal damage; nausea is quite common and she loses her balance periodically however, her church has employed her regularly a couple of days a week but, other than that, her income is totally from government allowances. She lives a spartan existence. Prior to the diagnosis, she was a single Mum and a very competent kick-boxer! Her daughter is now independent, and Melanie is still going to kick-boxing classes albeit on a non-contact basis. Given her balance issues, any move that involves a spin is a delicate movement for her but she soldiers on. I would like her to be considered because despite her circumstances, she is always befriending less fortunate people, is always volunteering for something but, most importantly, is very content and appreciative of her life. I recently spent 2 weeks with her in her little apartment and was so proud of her because she had little more than the basics (no tv and no internet), but couldn’t think of anything she really wanted for Christmas. From her perspective, she has a little apartment; a daughter that she is proud of; lots of friends; and a family who love her. From her perspective, she has it all! Your display would not only be appreciated because of the nature of it, but she would think that she had won the lottery!!!! Perhaps it was love at first sight. I didn’t quite know it then. Almost fifty years ago, till grieving for my late wife, I was cajoled by my brother to attend a twenty-first birthday party. Standing in a room full of happy young people, I didn’t know where to put myself. I was rivetted to the floor. Then. Across the room I saw her. My soles were freed. Over I went, and we stayed in each other’s company for the rest of the evening. We made a date. I waited for over an hour on Victoria Station, until she came running towards me. We sat in St. James’s Park. A pigeon pecked at the remains of a boiled egg on the tarmac. Simultaneously we each said: ‘Cannibal’. That was it. It was love. Love for life. The marriage ended abruptly six years later. The light she had brought to my life went out. The love did not. After almost forty more years during which we each remarried and led separate lives; and I was widowed again; we met once more at our son’s fortieth birthday party. We talked once more. At one point I realised that the rest of the chairs around the table at which we sat had been tactfully vacated. Within weeks we were back together. The light had returned. Six more years on, it does not wane. The lightcatcher deserves to be with her. 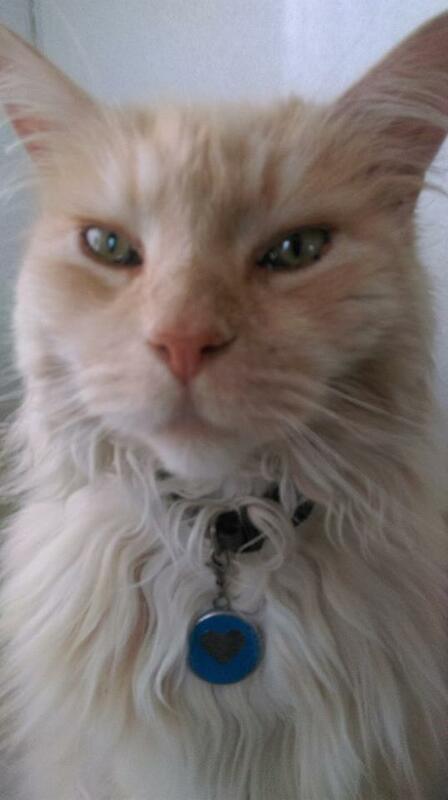 My nomination is a fellow blogger, Marlene. I know, a bit odd, since I don’t know her, except through her blog, and her comments on other blogs we jointly follow. She came to my mind straight away, and even though I sifted through my nearest and dearest, my thoughts kept returning to Marlene, so Marlene it is. I’m always touched and impressed by her soft, gentle positivity in her blog posts, and comments on other blogs and a recent one on The Kitchens Garden where she said she keeps her vibration as loving as possible so each encounter in the world reflects that. I do like that sentiment. I think she deserves this beautiful gift of light and joy. My friend, Amy, is someone who is most deserving of an unexpected gift out of the blue! She is a woman who has been challenged by the loss of several loved ones, and been disappointed by the actions of others. She opens her heart, make herself vulnerable, and in the process is sometimes taken advantage of. She never quite realizes that she is deserving of love and goodness. Yes, she has been blessed with good health, a steady income, and the love of one who means much to her, but those things don’t negate the fact that she needs reassurance, support, and love. She works hard, every day. She loves passionately, every day. She grieves deeply, every day. She deserves goodness, every day. My mind went immediately to someone I got to know through blogging, my friend Crystal. We have met a few times to get to know each other though she has moved farther away and works longer hours now. She’s been raising her daughter pretty much all alone all these years and done a very good job of it. She is also a veteran having served in the military state side. Having just purchased and moved into her new (quite old, in much need of love) home, the dangler would be just the thing to bring good Chi into her space. With her kind heart and great photographic talent, and her Native American heritage, I can see the dangler hanging on her porch outside her front door. I’m sure she would appreciate it. How could someone not. My friend Harry would never put this light catcher away with the Christmas decorations. He would give it a prominent place in his house—after much experimenting for the very BEST place, (Harry can be a bit artsy fartsy)—-making sure the sunbeams would strike it just so, then he and his dog and cat would dance with all the rainbows on the floor and walls in the same spirit of joy and fun he spreads like a tonic wherever he goes. He has lived many years and well knows the slings and arrows of outrageous fortune, but still, like a child of the light, seems to carry Christmas in his heart every day of the year. You might say he himself is a light catcher. Since he is much more accustomed to giving gifts than receiving them, he would be flabbergasted to receive this beautiful one, out of the blue, for no reason at all. I would like to nominate a friend of the past 25 years, Sue. She is gentle and kind but with a core of steel. She has had a difficult 18 months, having lost her father some years ago at a comparatively young age, and now having had a very ill mother who nearly died countless times because of an abscess on the brain. Sue works at a responsible job for a Big 6 accountancy firm 4 days a week. She has a school age daughter. Her mother lives some distance away but was fortunately able to be treated in London at a hospital near Sue, and now lives with her and the family for some of the time. Sue made it clear to her employers that her mother was her priority and stuck to that, despite the veiled job loss pressures the firm put on her, as these places do, and the general volume of work, and spent as much time with her as possible and beyond, sleeping in all sorts of awkward expensive and cheap places. And yet whilst all this is going on she has never once complained and is still always unforcedly cheerful and amusing and caring about her friends, asking about them and remembering details. She is a bright, funny and loving person and I always come away from time with her with a lightness of heart, despite her peculiar loyalty to Shrewsbury Town FC! She considers time spent with her friends a privilege for her but the privilege is for us, even though she would never understand that! This person had a particularly difficult start to life through an abusive family. Finally free and eventually with a trustworthy man, a veteran with his own challenges she was defrauded of her home and the legal system let her down. But she fights for her family and has pressed for fair treatment for her husband while rebuilding her life. She works for a large number of not for profits. Since I met this person blogging and have come to know and admire (maybe a little adoration too) her through her blog it is the community on line that she has created that speaks volumes. She helps people fulfill dreams – I read countless testimonials to how people start writing because of her encouragement, finding outlets where none existed before. Now she is running a competition to raise money for a sensing dog – yet another small but significant addition to an extraordinary portfolio. And boy will she adore the light catcher and keep it out all the time. My friend Puwen is an idea machine with the ability to move beyond ideas into action. A number of years ago, I came back from a visit to California with an idea for gardeners to donate vegetables to food banks. The outreach coordinator at my church put me in touch with Puwen, who she said was trying to get more fresh produce into the Arlington Food Assistance Center (AFAC). When we finally connected by phone, we talked for a couple hours. I connected her with a farm network that donates food from fields that can’t be harvested, talked about gardens, church gardens and then school gardens. We talked about getting donations from the farmers markets and community gardens. We talked about advertising gardening as a healthy way to get food. We threw around a lot of ideas. Then Puwen went into action. She got space at the local library for a garden, arranged pickup of left-over vegetables from farm markets and started talking with the schools about the amazing lessons that could be built around a garden: math, science, history, biology, botany. The first year, we hauled in 10,000 lbs of fresh vegetables to AFAC, some of it delivered to Puwen’s house. Now the take is more than 200,000 lbs. Unfortunately, the need has grown as well. But we’ve got people donating, being educated about plants and gardening, and just enjoying the way gardens look. And that’s not bad. Feeding people is good. Feeding people well is even better. As my American friends celebrate Thanksgiving, and as Advent approaches it is time to not only be grateful for all we have, it is also time to think about those who maybe have less or maybe need a little brightening moment in their lives. In keeping with the true spirit of the season, this is the time for giving. Let’s join together and bring back a little of the giving spirit here in Contented Land and see what we can come up with. 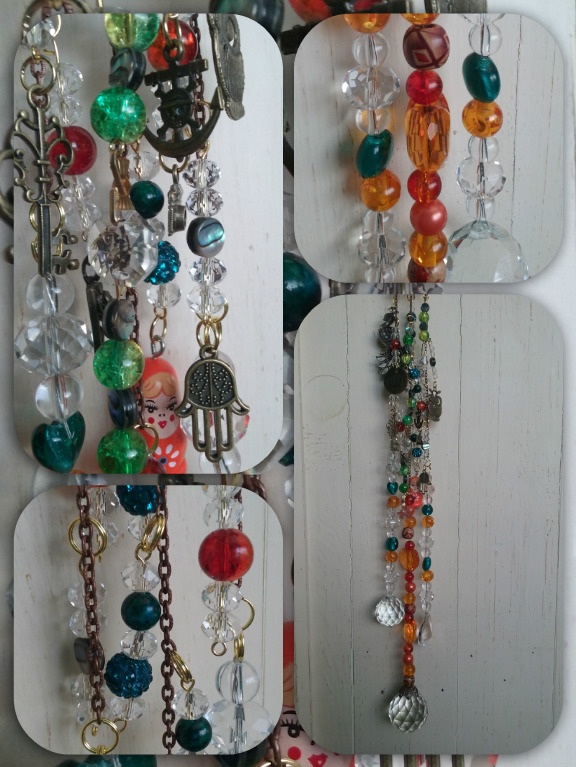 I’ve made a traditionally coloured Christmas Light Catcher – one that can be kept especially for this time of the year or, if the winner is so inclined, to hang up all year round. 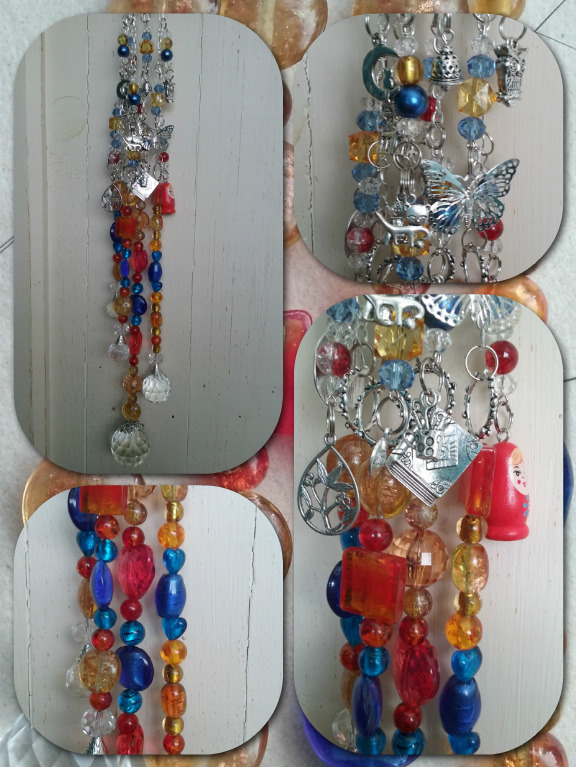 I love making these light catchers, to me they are a really special combination of textures, light and colour – they are always woven with the magic of intent and good wishes for the person for whom it is destined and time and thought goes into each one. I don’t have much I can give, but I can give this. I want to make a giveaway that is absolutely altruistic – no-one can enter for themselves, each must think of someone else and put in a little effort to share what that person means to you and why you want them to own this light catcher. I know it means a bit of thought and effort – different to a usual blog post – but I do hope you will be willing to take part. Anybody, any where in the world is eligible. This is a giveaway with a difference and every reader of this blog who wishes to take part gets to nominate someone to receive the gift and gets to be a voter for who will finally receive it. At the end of the seven days another post will be made where I will cut and paste all the stories minus your identification and a poll will go up. You will be able to vote for your first and second choices from the stories. The story with the most votes gets the gift. The poll will close three days after it opens. I will send the catcher directly to the person you have chosen in time for Christmas. What do you think? Do you know someone who deserves an unexpected gift? Now here’s a little about the light catcher. It is a three strander with three AAA crystal balls and several crystal rondelles threaded through out. 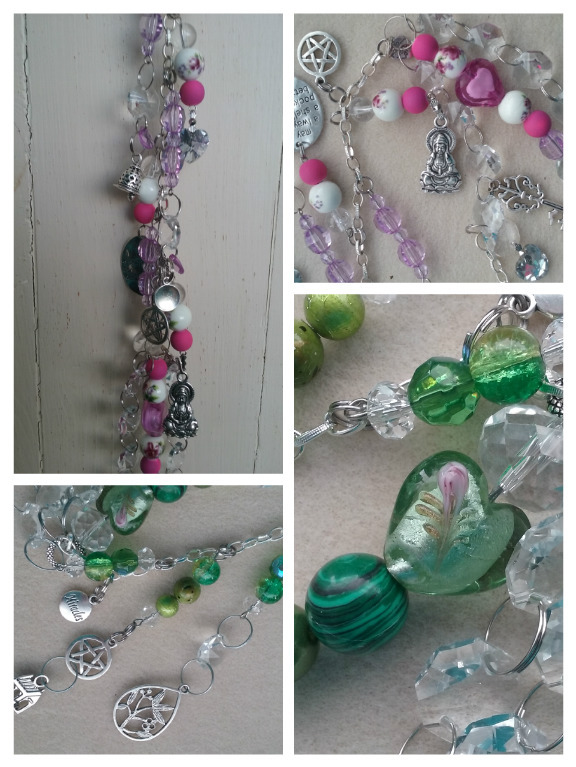 The main strands are threaded with red and green beads of crystal, glass and acrylic, many hand made. 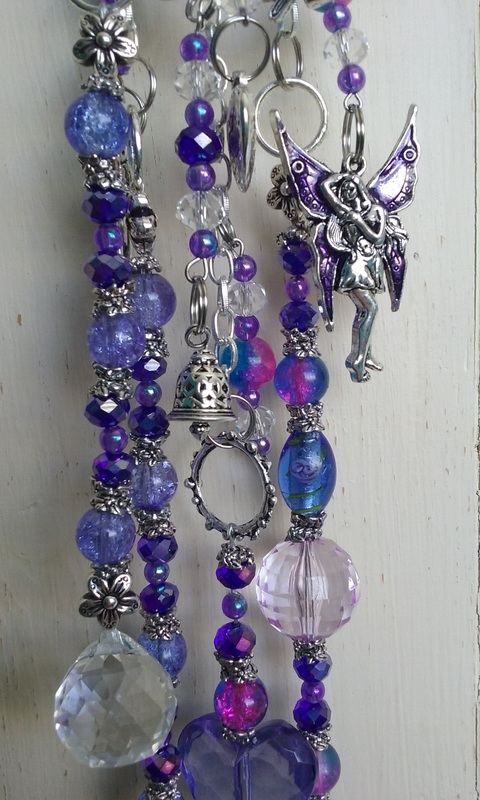 There are twelve charm threads with more crystals holding the different charms. 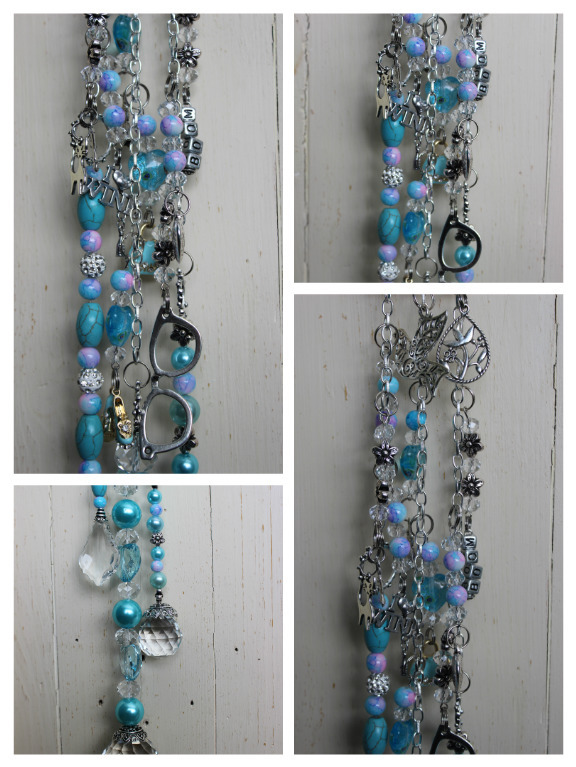 There are many, many charms on this catcher and more can be added when the winner is known, especially for that person! The right strand includes a sun; a heart; a house with two children and a cat and a dog and a pentacle for protection. Beneath that hangs a disc with ‘Remember the moments’ written on it. This strand may represent past or present Christmases – it is for the child, whether it be within or actual. 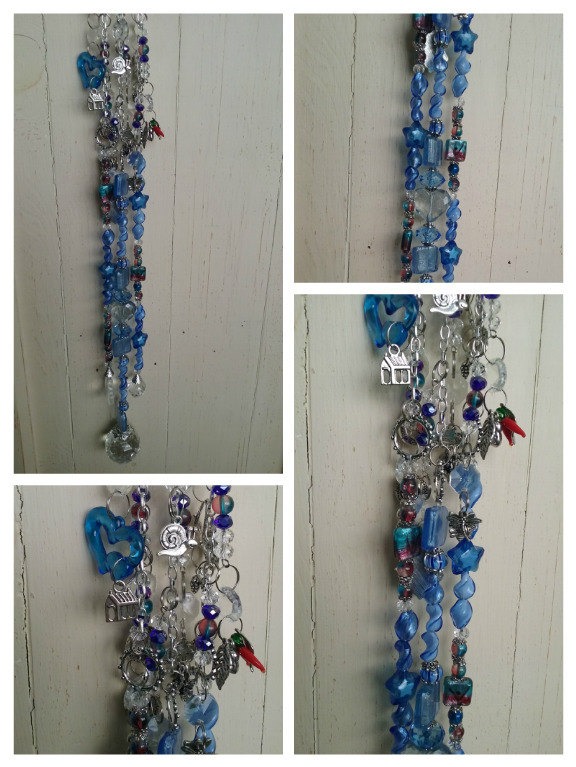 The centre strand holds the archangel Gabriel; a bell and a musical semibreve and a book. This represents the spiritual content of the season – the magic, the stories, the music. It celebrates the message ‘Peace on earth and goodwill to all’ It is for making memories old and new. The left hand strand holds a Buddha; a bird, a butterfly, a holly leaf and a flower; a lantern and finally a small disc with the word ‘miracles’ engraved into it. This strand reaches out to include all the world in the spirit of giving. This includes all ethnicities, all religions, all nationalities, all kinds of beliefs and all ways of life. It includes the wonder of nature and reminds us that we are all, every one of us, united on this fragile blue globe that hangs in the darkness of space and each of us is a light that shines into the world if we so choose to be. I hope you will share your special people, I hope you will come back to help choose the winner. I hope you will enter into the spirit of this Season of Giving. I’ve been busy making light catchers for the first wonderful customers who wandered into my shop and decided to start their Christmas shopping right there and then. Thank you all so very much! They are all finished now and on their way to new homes around the world, and as my friend Bruce says ready to ‘catch the light’ wherever they land. Aren’t these brights just wonderful! Then I returned to a softer palette and made one for a friend – it should be with her by now ……..
And another one for a swap – this one destined to hang in a limery ………… which is a lime version of an orangerie. I’ve made some that can’t be shown just yet and I have one more to make – for a Christmas Giveaway. Stay tuned. Somewhere in the middle of this playing with beads and sparkly things, Siddy had his hair cut. Later that day he saw there was some cheese being eaten …… Siddy is very fond of cheese! And the garden makeover is continuing slowly ………. So slowly there is nothing to show you yet – except chaos……….. Soon you know order has to emerge, right? 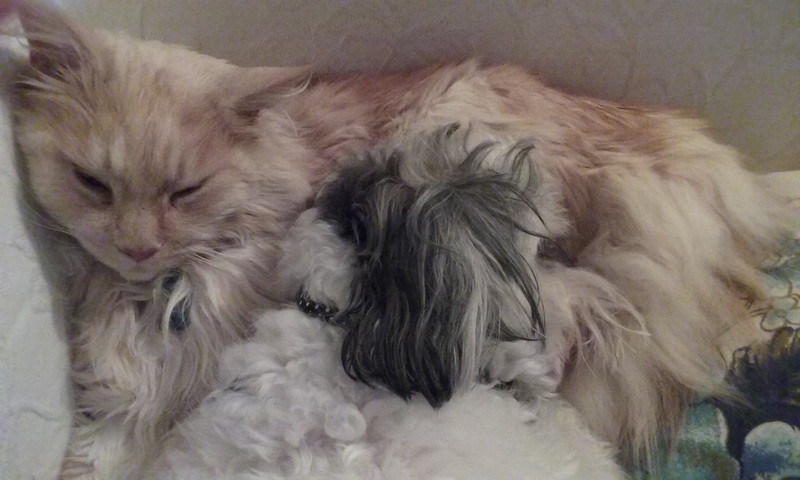 This is a recent photo, taken one evening on the sofa – Orlando is being cuddled with – not sure if he is enjoying it …….. but he stayed. Siddy was exhausted after a busy day and his mumma wasn’t sitting still, so the kitty had to do. Mumma was busy. Making light catchers for my customers, another one for a friend, another [really special one] for a Christmas gift. I’ll show you most of them in another post, right now I want to show you what I’ve just finished. If you have been popping into my store in recent weeks you may have noticed that most of the light catchers have ‘SOLD’ printed across them in big letters. Which is not a good look for any store is it? So I’m off to clean up my shop as soon as this post is up! Any way, having woken with a bit of an inspiration yesterday morning, I set to and made another one. For this one I had two colours in mind that I wanted to play with. Blue and purple. I chose the beads. I chose the bead caps and the little extras – and started to thread. Almost immediately Don McLean began singing in my head. ‘Starry, starry night, paint your palette blue and grey …………’ and then I began musing on starry nights and dreams and wishes. 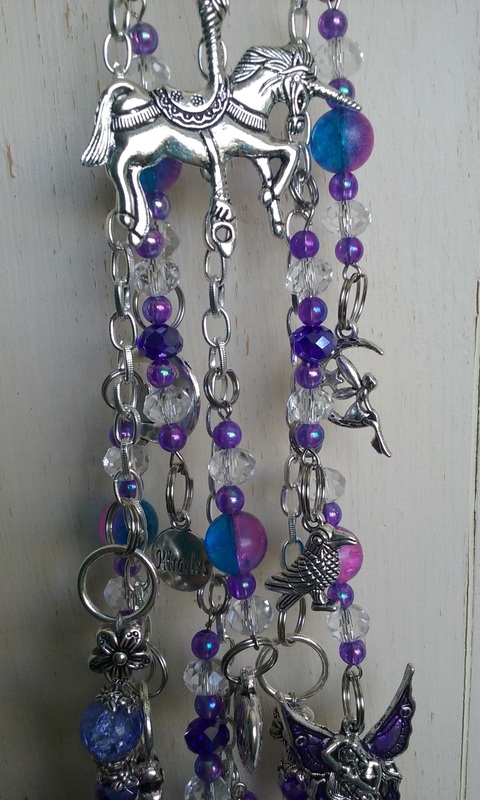 the beads grew and the strands multiplied beneath my fingers as my mind wandered through wishes and dreams and the magic of the night that grants those wishes and dreams……………..charms began to appear dangling from the charm strands – a unicorn, a fairy, an angel sitting in the moon. Harbingers of dreams coming true were placed, a bell, a crow, the word ‘miracles’, a heart, young lovers…………. And I found I had made a light catcher for a dreamer, one to make wishes come true. It’s not quite as deep a blue as the photos are showing – it is a softer hue of lilac, pinky purpley blue …….. unfortunately seemingly impossible to photograph with my skill level. I think it’s really pretty!